Italy fly-half Craig Gower will miss the Six Nations in order to undergo knee surgery. The Bayonne playmaker, a former Australia rugby league international, suffered damage to the anterior cruciate ligament in his right knee during Italy's 22-16 loss to Argentina on November 13 and goes under the knife on Wednesday. It is estimated that he will be out of action for between four and six months in order to complete his recovery. Gower has played 14 Tests since making his debut against Australia in June 2009. 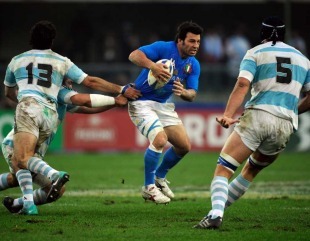 His place in the side was taken by Brive's Luciano Orquera for the Azzurri's remaining November Tests against the Wallabies and Fiji.